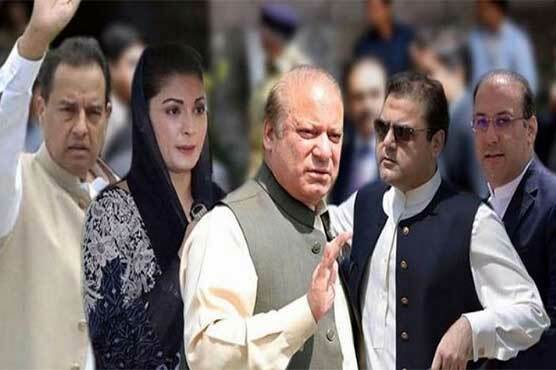 ISLAMABAD – An accountability court will today (Friday) announce verdict of Avenfield reference filed by the National Accountability Bureau *(NAB) against former prime minister Nawaz Sharif and his family in line with the Supreme Court verdict in Panama Papers case. Accountability court judge Muhammad Bashir had reserved the judgement after proceedings of Avenfield reference against Sharif family were completed. The court also ordered ex-PM and PML-N supremo Nawaz Sharif, his daughter Maryam Nawaz and son-in-law Captain (r) Muhamamd Safdar to ensure their presence in the court today (Friday). Judge Muhammad Bashir had also ordered the capital administration to make foolproof security arrangements in and outside the court. The Islamabad administration keeping in view the court orders has imposed section 144 around the Judicial Complex. There will be a complete ban on the assembly of more than 5 people outside the Judicial Complex, while 500 Rangers personnel and 1500 police personnel will also be deputed in and outside the complex. On the other hand, the security of accountability court judge Muhammad Bashir has also been beefed up and the Rangers personnel will be deputed at the entrance of the Judicial Complex. It is pertinent here to mention that Nawaz Sharif, Maryam Nawaz and Cpt (r) Safdar are nominated in the Avenfield reference, while ex-PM’s sons Hassan Nawaz and Hussain Nawaz were declared absconders. The Avenfield reference is one of three corruption references filed against the deposed Prime Minister Nawaz Sharif, his three children, son-in-law and former finance minister Ishaq Dar in compliance with the Supreme Court verdict in the Panama Papers case last year. On the orders of the country s Supreme Court, a JIT was formed last year to probe the allegations on the Sharif family.